Americans get mountains and mountains of junk mail. Did you know that you can opt out of this endless stream of spam? With just a few minutes work, you can sidestep most junk mail, without wasting your time or accumulating any more junk mail trash. Every year, junk mail creates 2.1 million tons of solid waste- that’s more than all bathroom tissue and paper products combined! 28 billion gallons of fresh water are used in production each year! Over 350,000 dump trucks are needed to haul away that much unrecycled junk mail. 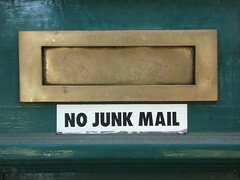 To opt out of most junk mail, all you have to do is call 1-888-5optout (1-888-567-8688). Another way to opt out is to cancel your catalog and bulk offers through the DMA’s website. Photo courtesy of ilovemayalopez at Flickr.com. While you’re at it, why not get rid of some of the other mail that clutters your mailbox? If there are any magazines that you receive but never read, why not cancel them? Some magazines are also available in electronic formats – you can subscribe to a tree friendly version and still keep your subscription. Also, you can sign up for e-statements from your bank and credit cards to reduce paper waste and pollution from transporting the mail.